We decided this year to just have a little afternoon tea for Willows birthday but by the time we invited a few friends and family her invite list was at 40+ people already. I had my fingers crossed for great weather or we would not have space to have everyone there. Luckily the sun came out and the flooding from the week before had just about gone. Willow loves colours.. anything Yellow or Purple. Her favourite TV program is the Care Bears so I decided to theme this little party Rainbows and Care Bears. We couldn't find anything in the shops with Care Bears on it so a lot of our games were hand made. We decorated with lots of rainbow windmills and balloons. The theme for this rainbow party was very easy, lots of colour and Willow even put in an order for Lolly cake, her favourite and balloons. We were so pleased with how her cake turned out, Willow loved it and couldn't wait to blow out the candles. Willow practised a few times during the week to blow out candles, she did so well considering she was petrified of the flames a week before. We played five different games, Pin the Rainbow on Cheer Bear, Care Bear Hide and Seek, Piñata, Pass the Parcel and Gold at the end of the rainbow. The Hide and Go Seek game was a huge success with the kids all running around everywhere trying to find all the Care Bears. Pin the Rainbow on Cheer Bear, we brought a large sheet of white paper and did our best to draw Cheer Bear. I laminated the little rainbows and put blue tack on the back for the kids to stick onto the poster. We had a winner for the little children and one for the bigger children. The bigger children were blind folded. Prizes for this game were a make you own Toucan Sock Toy and Plasticine Set. I made a large Rainbow Piñata, it took a while to make as this year I wanted it to be a bit stronger. The kids hit it for a long time before a crack was made. After a while the Piñata came off the clothes line so we just tipped the final bit out for the kids to collect. A dairy around the road has a box of little toys 2 for 50c. They are all little bits and pieces that come out of magazines like stickers, bangles, nail polish, toy phones, erasers, cars. I brought a few of these for inside the piñata and added lollies and confetti. There were heaps of goodies for all the children. Care Bear Hide and Seek. I found pictures of Care Bears on the internet and printed them out and laminated them onto a sheet. I brought a book of stickers for $3. The children had to go around outside and find the pictures of care bears and match a sticker on their sheet with the one on the Care Bear they found. Willow's uncle hid them really well so it took a while and a lot of team work to find them all. The kids handed in their sheets to get a prize. Care Bears with a sticker the kids had to match on their sheets. Pass the Parcel was fun, it had got quite cold outside so all the kids squeezed into my little lounge to play. Every time the music stopped the child who was holding the parcel unwrapped a layer. Each layer had a small Care Bear and a lolly pop for the child. We played music from the Care Bear Movie. The Winning Layer had a Hallmark Recordable Canvas Art Set in it. Last game was just a bit of fun for the older kids. Jamal and Leroy marked out rainbow lines for the kids to throw from. We had a rainbow with a pot of gold at the end the the kids could test their skills and see if they could fill it up. They had heaps of fun competing against each other. During the day a lot of the little kids ran around, played in Willow's rainbow tent, on the slide, swings and in the playhouse. We also had the Little Coupe cars out and some bikes and scooters. There was so much for everyone to do. Willow's three brothers blew up so many balloons the day before to make a huge rainbow for her. She loved it. We also got out the bubble machine to make rainbow bubbles. Willow and her little friends loved this. We found cute little Rainbow bags at the junk stores around the road from us that we filled with lots of goodies for Willow's little friends. Each good bag was different but here are some of the things we put inside them. Finished Loot Bags ready to give out to all Willow's friends. 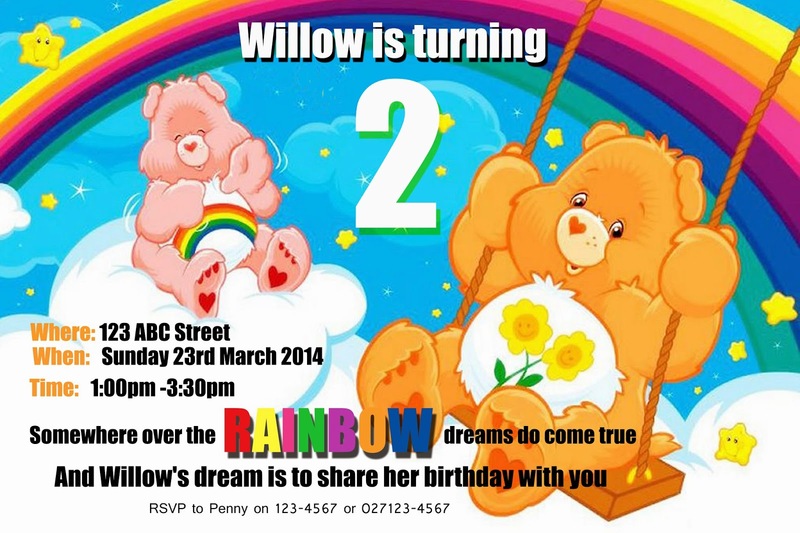 Thanks to family and friends who came and celebrated with Willow at her rainbow and Care Bear Party.